Posted on October 12, 2014 by Becka in How To, Recipes. Place water into a large pot, deep enough to completely submerge eggs. Add eggs and bring to a boil. When boiling, remove from heat and cover for 10 minutes. Transfer to a bowl of ice water for 5 minutes. Then peel the eggs and slice in half lengthwise. Gently remove yolks and place in a large mixing bowl. Select 24 of the nicest whites to fill. Mash all of the ingredients together until smooth. Alternatively, place all the ingredients in a food processor fitted with a metal blade and process until smooth. Adjust the texture with additional mayonnaise as needed. Season with additional salt as needed. Prepare a piping bag with a round tip to fill the eggs. Place filling into the piping bag and pipe directly into the whites, holding the piping bag vertically, until the white are completely full. 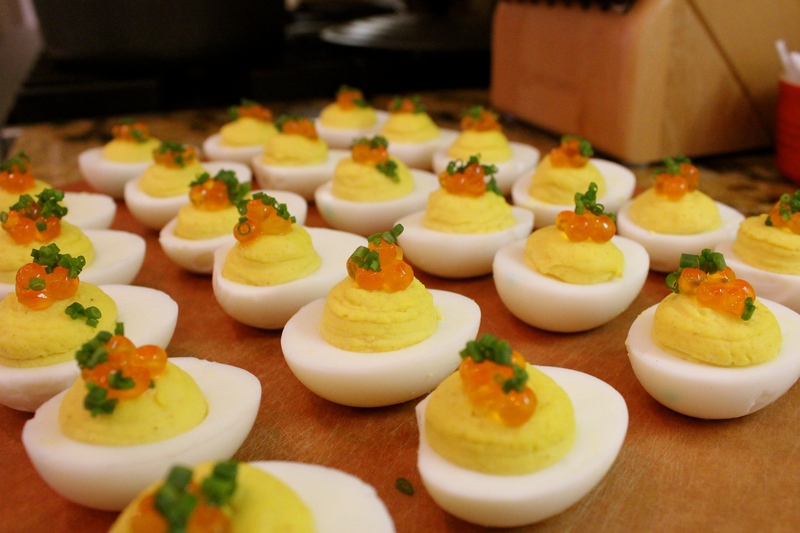 Garnish each egg with 4-5 roe and a sprinkle of chives. To see this recipe in action, check out the Plate & Platter YouTube channel. Emily on Mediterranean Diet Better For Your Health?